Not only are mitochondria responsible for generating ATP, but they act as sensors of cellular distress, and are the first parts of the cell to send and respond to cell death signals. 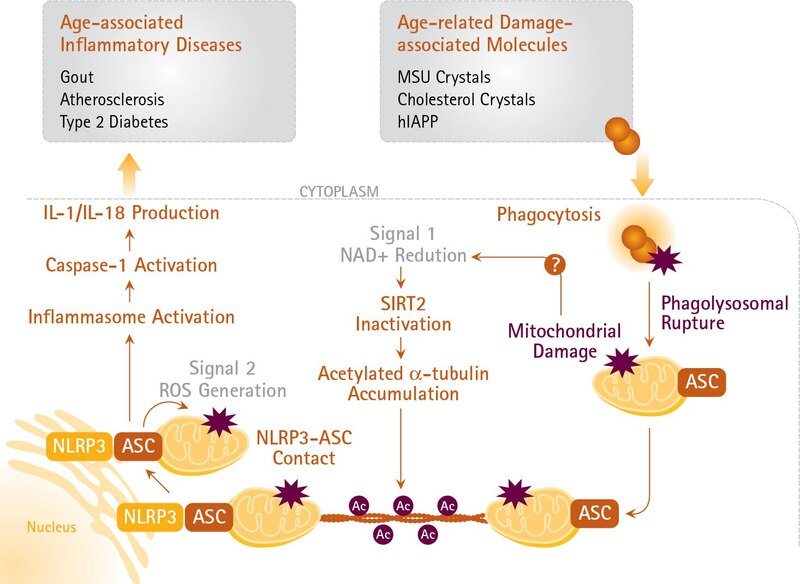 Since the 2013 publication of The Hallmarks of Aging, the role of mitochondria in regulating inflammation in response to metabolic change (via mitochondrial sirtuins) has received greater attention. Mitochondria send signals via calcium signaling and reactive oxygen species (ROS) to the NF-κB pathway, as well as via damage-associated molecular patterns (DAMPs) to the inflammasome, to activate “inflammaging.” In turn, proinflammatory molecules regulate mitochondria by causing decreases in mitochondrial membrane potential, a sign of poor cell health. Melatonin signaling, on the other hand, affects the mitochondria positively, maintaining the integrity and function of these organelles. Melatonin decreases inflammation and maintains the efficiency of electron transport. Because of these powerful effects, maintaining melatonin levels via pharmaceuticals or by circadian regulation is an area of therapeutic interest. The future of mitochondrial dysfunction research will certainly include more genetic and epigenetic data around mtDNA, as well as their implications for innate immunity. Mitochondrial dysfunction caused by aging-related insults can direct chronic inflammation mediated by the inflammasome, which is a multiprotein complex that includes NLRP3 and ASC. Kapetanovic R, Bokil NJ, Sweet MJ. Innate immune perturbations, accumulating DAMPs and inflammasome dysregulation: A ticking time bomb in ageing. Ageing Res Rev. 2015 Feb 25. pii: S1568-1637(15)00028-8. Hardeland R, Cardinali DP, Brown GM, Pandi-Perumal SR. Melatonin and brain inflammaging. Prog Neurobiol. 2015; 127-128C:46-63. Liu TF, Vachharajani V, Millet P, Bharadwaj MS, Molina AJ, McCall CE. Sequential actions of SIRT1-RELB-SIRT3 coordinate nuclear-mitochondrial communication during immunometabolic adaptation to acute inflammation and sepsis. J Biol Chem. 2015; 290(1):396-408. Approximately 3,000 genes are needed to make a mitochondrion. Of these, mitochondrial DNA (mtDNA) encodes 37 genes, and the remaining are from nuclear DNA (nDNA). Just like our cells find ways to reduce mitochondrial stress, as we age, we find ourselves finding ways to reduce stress and feel more at peace. Melatonin can help aging mitochondria cope with stress - and melatonin helps our entire bodies deal with life's stressors as well. A little bit of sunshine goes a long way. The OxyICC™ kit provides reagents for fluorescent immunocytochemical detection of cellular protein carbonyls. This simple assay detects carbonyl modifications using dinitrophenylhydrazine (DNPH) to provide highly sensitive and quantitative results. 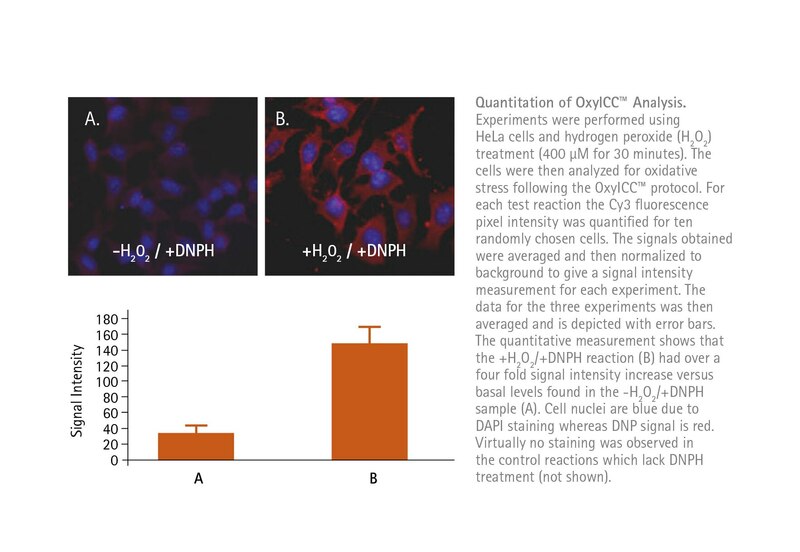 The OxyIHC™ Oxidative Stress Detection Kit contains the chemical and immunological reagents necessary to detect protein oxidation in various tissues from a variety of organs and animal species. The DNP-derivatized proteins are detected using an antibody that specifically binds to the DNP moiety. Subsequent incubation with biotin conjugated secondary antibody, streptavidin conjugated HRP, and development using a 3,3’ diaminobenzidine (DAB) staining allows immunohistochemical detection of protein oxidation.